Such a problem can occur if you have selected no elements to count in .doc, .docx, .xls, .xslx, .ppt or .pptx file format settings. 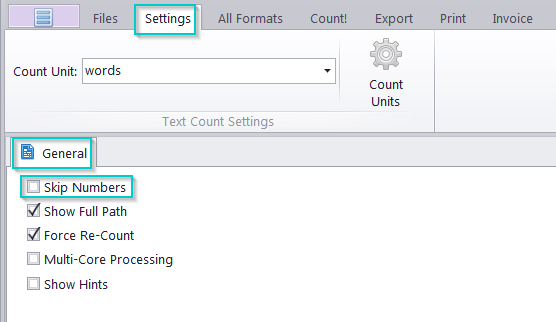 Please select all elements which you want to include in the counting process and you will get correct count results. For this, please Select Settings > [Current file format] after adding at least one file of the format to the program. In the next window, select all required elements. Also please check whether you have the 'Skip Numbers' function deselected. For this, please add your files to AnyCount and then click on Settings >> General. If the problem persists, try disabling "Multi-core prosessing" in "Settings >> General".